While it may have laid down roots in the late Sixties and Seventies, with the blockbuster success of films like Rosemary’s Baby (1968) and The Omen (1976), or with the resurgence of interest in occult matters after the founding of Anton LaVey’s Church of Satan, the “Satanic Panic” is really a relic of the Eighties. It was a time when such seemingly innocuous things as rockstars prancing around in tights and big hair, half hour toy commercials masquerading as cartoons or kids rolling dice while sitting around a table were taken as portents of a coming battle for the soul of the world. 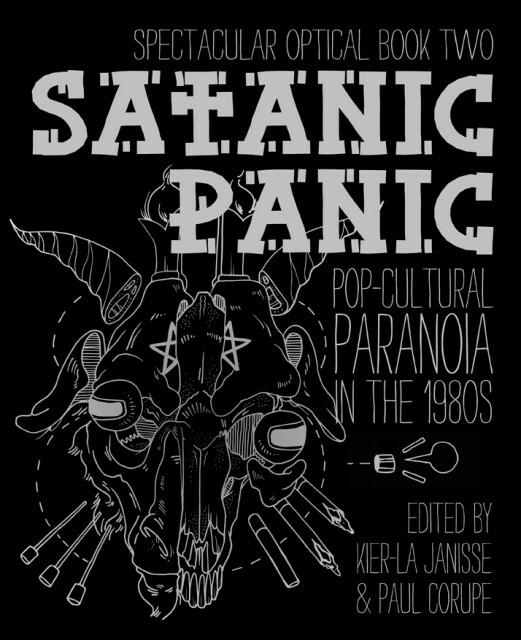 The second in indie publishing company Spectacular Optical‘s slate of pop culture analysis texts, Satanic Panic is an essential resource for understanding this momentary mass hysteria, exploring in depth both the causes of the craze and the effects it had on Eighties society and beyond. The book is a collection of essays from twenty-odd contributors, examining the way paranoia about Satanic worshippers and a rising interest in the occult influenced the publishing world, film, music, and television. Satanic Panic then goes on to demonstrate a variety of evangelical Christian reactions to a supposed rising tide of evil entertainment, as well as the Panic’s eventual spread across the globe. Running through the collected essays is a sense that while the Satanic Panic played out as another front of the culture wars, there were some real victors behind the scenes. These include publishing houses that profited off of Satanic narratives, either fiction or non-fiction; film distributors who were able to make a quick buck off the craze, with movies of varying quality; a network of evangelical Christian operatives creating melodramatic illustrated tracts, cheapie VHS tapes about how to keep Satan out of the home; lecture circuit engagements with supposed former Satanists-turned-speakers; and the music industry’s solution to encroaching black and heavy metal, “white” metal. It was especially fascinating to learn about some of the more extreme responses to the manufactured Panic, as aside from my having read Jack Chick’s mordantly hilarious Dark Dungeons tract, I basically knew nothing about these going in. Other pieces in the book focus on the media narrative surrounding and feeding the Satanic Panic, with special notice given to a few highly influential TV broadcasts, like the 1985 20/20 episode on “Devil Worshippers”, and Geraldo Riviera’s 1988 special featuring Anton LaVey’s daughter Zeena Schreck. One criticism I have about this aspect of the collection is how many of the pieces in the book end up talking about these two landmark events, but this is something that must have come about with so many of Satanic Panic‘s contributors attempting to set their own works in context of the age. A later piece, about an HBO TV movie dramatizing the McMartin Preschool abuse trial, might have benefited from inclusion earlier on in the collection, as that landmark court case is also mentioned often early on in the book without much in the way of explanation. Still, the film and media criticism on display in the book is excellent all around. The last few articles in the collection focus on the Satanic Panic’s spread across the globe, with an extremely interesting look at avant-garde artist Genesis P-Orridge’s battles with would-be censors in England, painters and authors like Rosaleen Norton falling under suspicion in Australia, and the appropriately over the top Quebecois Catholic reaction in Canada. It was fascinating to see how the influence of the Panic took a longer time to disseminate across the world than I’d thought. If there’s anything this collection lacks, it’s more examinations of Satanic Panic’s influence, like in places where English isn’t the dominant language. Still, the glimpses we see of the worldwide hysteria are very informative and well-written. Most of the articles feature a good bibliography for further reading, as well. The full force of the Satanic Panic of the Eighties was long over by the time I was able to understand such things, and as such I found Spectacular Optical’s second book to be invaluable and fascinating. While I think modern society likes to think that such moral crises are in its past, recent events like Gamergate last year and the racist politics currently being peddled by the Conservative government here in Canada show that peoples’ passions can still be inflamed with the right amount of spin and media attention. Satanic Panic, then, is not only a superbly entertaining piece of pop culture study, it also presents an object lesson in the wisdom (or lack thereof) of crowds. Full disclosure: I received a copy of the book in exchange for an honest review. Next PostFollowup Questions: An Interview with Kier-La Janisse, editor of Satanic Panic!